As the post-war years ushered in the Modern Age, most aspects of daily living were changing, bolstered by technology and the desire for “progress.” Changes observed by boomer children that set their generation apart from earlier generations included kitchen appliance technology, TVs and transistor radios, clothing fabrics and many others. Nestled in the daily living category was another big change in daily living, especially as it pertained to school children: the writing pen. Boomers lived directly in the path of the changeover from fountain pen to ballpoint pen and on to disposable pen. Exactly where on the timeline each boomer falls, coupled with regional adaption rates, marks what types of experiences boomers had with these writing instruments. For Mister Boomer and millions of other boomers born in the early 1950s, fountain pens were still used in schools alongside ballpoint pens. Fountain pens were not a recent invention by any means. 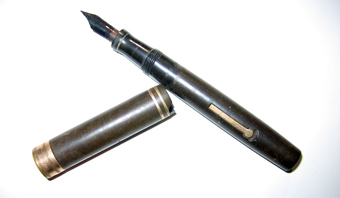 The first record of a fountain pen dates back to the 10th century, when a pen containing a reservoir for ink and a nib with which to write, thereby transferring the ink to paper, was commissioned by a caliph who was tired of getting his hands full of ink with the quill-and-dip method that had been used for centuries. Through the next few hundred years people tried to improve on the design to better control the flow of ink, prevent smears and paper tears, and make refilling the ink reservoir as easy as possible. By the late 1880s, the first mass-produced fountain pens were introduced in the U.S. From that point on, fountain pens replaced the quill as the writing instrument of choice, and the design and mechanism was constantly being reinvented and improved well into the 20th Century. A generation earlier than the boomers, the fountain pen was the only choice when writing with ink for schoolchildren and adults alike. This one was used by Mister Boomer’s father in the 1930s. Flash forward to the boomer years, when the ballpoint pen began to take over. The first ballpoint pen was introduced in 1880, but like the fountain pen before it, problems in the control and delivery of ink to paper and inability to mass-produce the instrument economically hindered its widespread adoption. Consequently, it took over 50 years of experimentation and reinvention before a practical model was sold to the public. The year was 1948 — early boomer years — and that first ballpoint pen cost nearly ten dollars, a princely sum in that decade. Cost was a factor that hindered a mass consumer migration to the ballpoint pen, especially for school children. Hence, early boomers were more likely than later boomers to write with fountain pens in their beginning penmanship classes. By the 1950s, with pen technology improvements, reformulation of the ink itself and the widespread use of a variety of plastics and metals would gradually hasten the replacement of the fountain pen with the ballpoint system. Mister Boomer recalls that writing instruments for his earliest school days were crayons and pencils. All of the instruction on learning how to write dictated the use of pencils. So it wasn’t until third grade when ink-based writing instruments became a part of the school scene. Mister B had seen and used ballpoint pens from an early age. His father received many as promotional company giveaways from work relationships as well as from neighborhood banks and retail establishments, so he and his boomer siblings would draw with them at home before even learning the alphabet. Now a sophisticated third grader, it was time to move up to using ink — a permanent medium — for writing, while pencil remained acceptable for disciplines that may require changes, like math or test-taking. Those early ballpoint pens, Mister B recalls, often clogged and leaked at inopportune times (that’s why the pocket protector regularly appeared as standard equipment for early boomer boys who were required to wear white shirts to school). Whether for that reason or because of the “cool” factor, Mister B bought a fountain pen somewhere around the fourth or fifth grade. By the very nature of the metal nib and flowing ink, fountain pens were best suited for cursive writing where the pen didn’t have to rise from the paper substrate until each word was completed. Mister B’s pen was a Scheaffer, the exact model of which has been lost to history. It had a chrome metal cap to cover the nib, but the body was clear plastic — a form-follows-function modern touch that was all the better to see how much ink remained. Unlike earlier models, Mister B’s pen employed the new plastic cartridge technology that appeared in the 1960s. Refilling the pen was as easy as unscrewing one cartridge and putting in another. He quickly found, however, that piercing the plastic cartridge on installation posed its own hazards as he was rewarded with blue-stained hands and shirts on many occasions. On the other hand, writing with a fountain pen required control and timing: too much pressure, the nib could tear the paper, too little pressure and ink could drip from the nib, while lingering a fraction of a second caused ink to pool on the paper, increasing the likelihood of a smear. After about a year, Mister B had had his fill of the fountain pen. Around that time, a new device had arrived on the market: the disposable Bic pen. First seeing one in the hands of a schoolmate, he was able to try it out and found the writing remarkably smooth. Then he began noticing the TV commercials for the pen. While Mister B continued to use click-and-write ballpoint pens throughout his remaining school days, the disposable pen was perhaps the final straw that broke the camel’s back of the fountain pen for him and many other boomers. Boomers born in the 1960s, then, probably never had the fountain pen experience we early boomers had. Has that contributed to the luxury market for fountain pens today, or is it pure nostalgia? What memories do fountain pens bring for you, boomers?